The holidays are almost upon us. Do you know someone who is a cigar aficionado? Yes, there are a lot of options out there. Choosing the correct gift can be daunting. Yes, Boneshaker does make this sound more like a cigar more apropos for Halloween, nevertheless, these new age cigars are said by critics to contain “a symphony” of various seasonally-inspired flavors that should appeal to any cigar lover seeking something more exciting in their cigar-smoking life. This is a blend of Nicaraguan tobacco wrapped in smooth Connecticut Broadleaf. Boneshakers are a combination of Christmas morning espresso, seasonal spice, and yule log oak and charred wood. Cigar sources say it amounts to being one of the most “unique flavors” one could enjoy over the holiday season. Pepperbox cigars are reputed to have a spicy kick that some sources suggest will ignite a cigar smoker’s “deepest passions” during the upcoming holidays. Each cigar contains four separate distinct tobaccos and is wrapped in an authentic Nicaraguan wrapper. The combined flavors swirl together like stripes on a candy cane. This is actually a special holiday package for folks who just don’t have enough time to wrap all the presents. This has been on the market every holiday season for so long it is almost legendary. 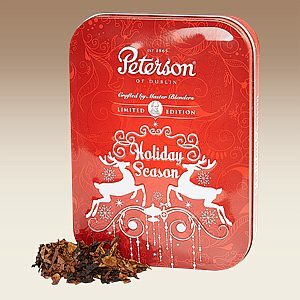 Unlike some cigars that can be too overpowering for holiday visitors, these cigars have a refined, mild taste and scent. Shopping pundits say this is “the perfect gift” for your cigar-smoking friends and family members when you are rushing around trying to get all of your seasonal shopping completed. This is a diverse festive 10-cigar sampler that allows your fave cigar fan to sample what some experts consider “the best” this holiday season from a wide variety of big name companies. Included here are cigars from Avo, Baccarat, Partagas, and Romeo y Julieta. The seasonal selection also features the work of some popular newcomers such as H. Upmann Legacy and Sam Leccia White which finishes off this festive assortment that some say may soon become “a modern holiday classic” for cigar smokers.